Do you have your terminal windows arranged in a particular way, perhaps running particular processes, that you want to consistently resume to without having to rearrange and relaunch things? 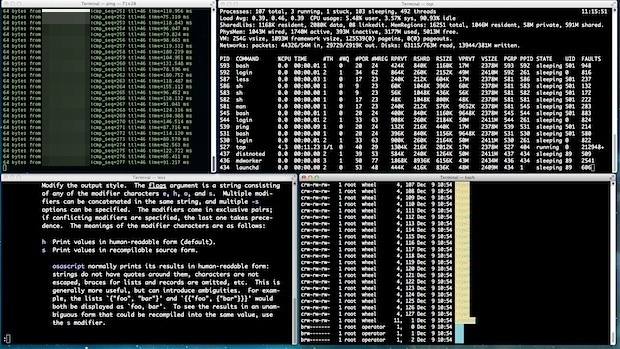 Rather than relying entirely on the OS X Resume feature, you should use the Terminal app “Window Groups” tool, which lets you save not only the placement of groups of terminal windows, but also their commands and processes. These can be quickly resumed to at any time, making it simple to manage specific window configurations and workflows for specific command line tasks. This feature has been around in Terminal app on the Mac for quite some time, but it goes largely ignored even by the most advanced command line users. Fortunately, it’s extremely simple to configure and to use, and once you get accustomed to it, you’ll wonder how you ever functioned in Terminal without it. 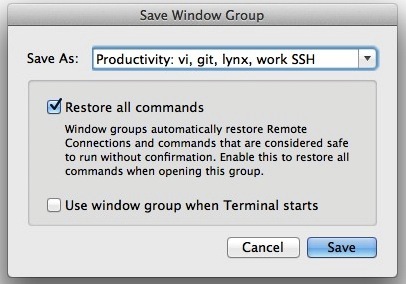 If this is going to be a frequently used placement of windows and commands, you may want to check “Use window group when Terminal starts” as well, which sets a Terminal app specific restore functionality upon each launch, going beyond the default restoration and resume functions of OS X. Ready to restore to a specific terminal group? That’s all there is to it. Assuming you used the “Restore all commands” preference option, everything will be pretty much where you left off. If you’re going to use Terminal Window Groups for reconnecting to remote servers, be sure you have SSH keys configured so that the connection becomes automatic without having to enter passwords and login details, otherwise you’ll need to continuously authenticate with each resume of a window group that has remote sessions. Get specific with this and you can have a terminal window group defined for completely different tasks, or for different times of day. For example, you may have a routine group of windows used for a specific set of tasks with a particular placement and set of commands running, like a large lynx browser on half the screen, with nettop monitoring network traffic in one corner with an active SSH connection to a remote server – save that as a window group and you can instantly resume not only the placement, but also those commands themselves, anytime, just by selecting that saved window group. Another great perk to terminal.app specific Window Groups? They work even if you have the system-wide Window Restore feature turned off in OS X. Give them a try, you’ll be more productive. How do you restore tabs or windows working directory i you use custom shell? Great article. But when I restore a Window Group, I’m not being automatically logged back into my remote sessions. I am able to ping the remote server, and I do have my ssh keys setup. Any ideas why this doesn’t work still? When I restore my Window Group, it doesn’t even attempt to re-login to the remote servers. It just comes up as a new terminal session. Use the remote login option in the terminal menu. shell-> new remote connection (and then specify the ssh command you want). That way when you restore it also logs you into the remote server and runs the command you want… e.g. remote top, etc. Ugh. You should just use iTerm2. When I try to save a window group, It doesn’t give me the option to restore all commands etc. The only option given is use window group on startup. And then the group opens up as all new terminals. I am using mac OSX 10.6.8. Was this feature added on only after Snow Leapord?